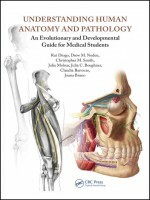 Understanding Human Anatomy and Pathology: An Evolutionary and Developmental Guide for Medical Students provides medical students with a much easier and more comprehensive way to learn and understand human gross anatomy by combining state-of-the-art knowledge about human anatomy, evolution, development, and pathology in one book. The book adds evolutionary, pathological, and developmental information in a way that reduces the difficulty and total time spent learning gross anatomy by making learning more logical and systematic. It also synthesizes data that would normally be available for students only by consulting several books at a time. Anatomical illustrations are carefully selected to follow the style of those seen in human anatomical atlases but are simpler in their overall configuration, making them easier to understand without overwhelming students with visual information. The book’s organization is also more versatile than most human anatomy texts so that students can refer to different sections according to their own learning styles. Because it is relatively short in length and easily transportable, students can take this invaluable book anywhere and use it to understand most of the structures they need to learn for any gross anatomy course.